This set of three double moulds which cast the six pieces required to make a complete chess set side: King, Queen, Bishop, Knight, Rook, Pawn. You will require about 16 bars of metal to complete a full chess set. 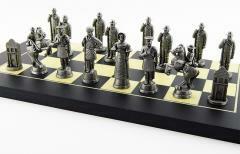 The other half to this chess set is The Mexican Side (PA726). Please note the miniatures shown are for display purposes only.